Webinars are literally the highest-converting online sales strategy in the home business industry. Don't believe me? Look around. A top producer in 2 programs, I'm friendly with a lot of other leaders in the home business industry. Not every leader in the home-based business industry blogs. Not every leader runs Facebook ads. Not every leader prospects or uses Instagram. Not every leader uses YouTube. Having grossed as much as $100,000 in 7 days from webinars alone, and having taught webinar marketing to thousands online (including many industry top producers), I know webinar marketing is likely to be the most profitable skill you ever learn as a home business owner. The kind of webinars I'm talking about are webinars where you teach a marketing skill of some sort (Facebook marketing, Instagram, YouTube lead generation, or copywriting or something else). Then on the webinar, after the training section, you offer a product or service that allows webinar attendees to go deeper into the strategy you covered. You do a complete close and cover what's in the product/service, its benefits, price, etc. and ask for the sale. 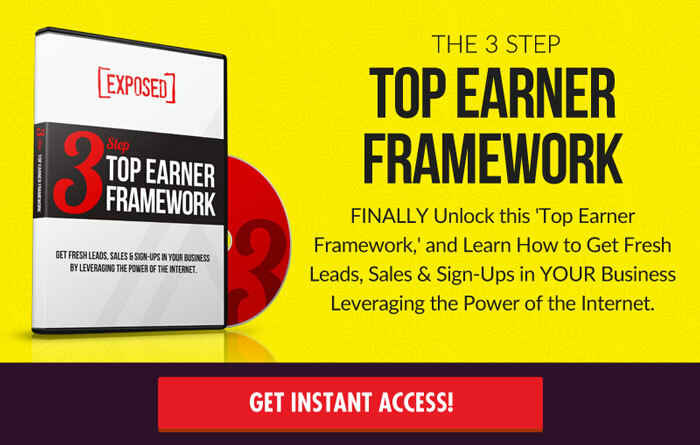 RELATED: WEBINAR MARKETING:The 5 Step Formula to Quickly Skyrocket Your Sign-Ups, Sales, and Income! Here's the 3 little-known reasons why webinars are the industry's most effective selling strategy. The most popular (and I'd suggest, overrated) alternative to webinars are video sales letters. A VSL is a video with text that's read by the presenter. Because VSLs are so popular I'm going to compare VSLs to webinars. Video sales letters typically only close around 2%-5% of visitors to sales. In contrast, webinars usually close 8%-20% of attendees into sales. That's a HUGE 4x difference. Webinars convert attendees into sales MUCH more effectively than VSLs convert viewers into sales. When you send a salesy-sounding email to your list, or email a link to a video sales letter, or promote a video sales letter on, say, Facebook, that is “interruption marketing”. No one checks their email with an intent to watch sales videos. Your prospect doesn't go to Facebook to see the ads. Fundamentally, video sales letters are intrusions. They're interruptions. So when someone finds hits a video sales letter, they usually click away from the video sales letter immediately, or within the first few minutes. A lot of marketers have tracked this and the percentage of people who watch VSLs until the end is very low, usually in the 10%-40% range. Thus only a small fraction of people who start watching a VSL actually stick around long enough to see the offer presented. A webinar is not interruption marketing. A webinar happens at a particular date and time. A webinar is a “scheduled event”. And scheduled events (wedding, vacations, doctor appointments) are considered FAR more important than the zillion little things you do every day that do not get scheduled (like washing your hands, drinking water, and surfing the Internet). That your webinar is a scheduled event one adds to one's calendar elevates the importance of the event in the mind of your prospect. That sense of “importance” increases your closing ratio. Attendees on a webinar tend to pay MUCH more attention to the content of your webinar than they would pay to a random video sales letter they hit from an email. A typical video sales letter is 40 minutes. A typical webinar is around 60-100 minutes, about twice as long. Unlike a VSL that will tend to have only 10%-40% retention until the close, a well-crafted webinar will usually have 70%-90% retention until the close. So you not only have much more time on a webinar to train and cover all the angles during your close, you'll tend to have a much higher percentage of viewers remaining to see it. In his book Influence: Science And Practice, psychologist Robert Cialdini of Arizona State University suggests humans are very predisposed to comply with the requests of authority figures. This tendency for people to comply with authority figures works to your advantage on webinars. As the webinar presenter/trainer, you begin the webinar positioned as the “expert”. Your status as the authority heightens as you teach. When you move into the close, your audience is biased to comply with your call to action to buy now. This bias increases your closing ratio. In summary, webinars convert into sales much more effectively than video sales letters (VSL). The “scheduled” nature of webinars amplifies webinars' importance in the mind of attendees and heightens attendees focus. That a webinar is a complete 60-100 minute presentation with high retention allows you (the presenter) to cover all angles during the close. Finally, doing webinars positions you as an authority, and attendees are biased to comply with the requests of authority figures (such as a call to action to buy). All these elements conspire to make webinars convert more attendees into sales than any videos sales letters (VSLs) or any other online sales strategy. If you're not doing sales webinars, arguably the industry's most effective selling strategy, you are leaving a LOT of income on the table every month. 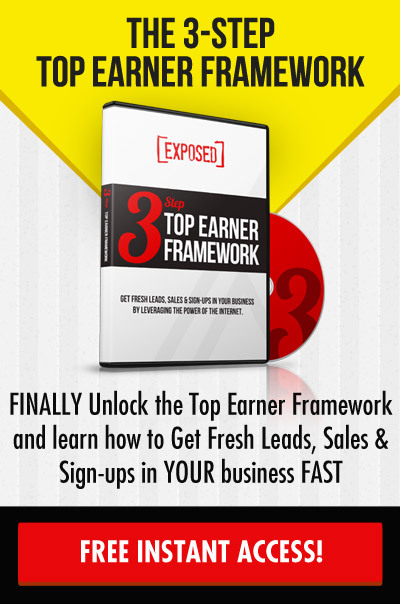 Learn the fundamentals of webinar marketing, and get started selling with webinars! P.S. – Click here to learn how to earn an extra $2,000-$4,000+ per month in YOUR business with webinars even if you're just getting started. Got value from this post? Then we would LOVE for you to comment below and share on FaceBook… Research has shown that as you share this MLSP blog post & comment below, the universe will bring amazing things to your life. 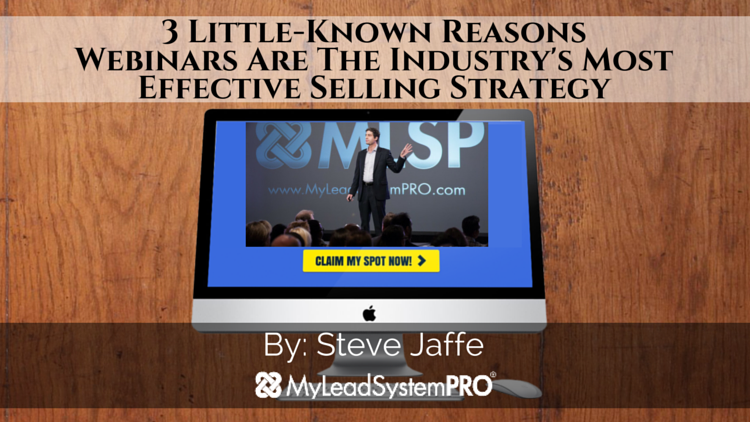 Steve Jaffe, MBA is a top producer in 2 programs, a highly sought internet marketer and a pioneer in the fields of webinar marketing and video marketing. An L4 MLSP leader who has sponsored 300 people, Steve has trained hundreds from the stage and been featured in several industry publications. One of the most effective webinar marketers in the industry, Steve is a top seller of MLSP's 100% payout products and has pioneered many of the industry's most effective webinar selling strategies. Steve holds an MBA degree from MIT's Sloan School Of Management, and a B.A. from Stanford University. Bam!! Hangouts And Webinars Also Give That LIVE Connection. I have been using webinars myself, and I have not gotten to your level yet, but I have made most sales of mine through them. I also get more leads on my list from the promoting of a webinar than just about anything else, so there is another small benefit to them. I plan to use them more often, and make them my major focus for sales. Awesome! Do you have a VSL ? I would love to to view it?